Optical lenses are ubiquitous in technical and scientific applications as well as in animals. This explains the importance of developing the lens formulae in courses of geometrical optics. Textbooks, however, often give only an elementary discussion, limited to thin lenses in air. Our aim is to present the deduction of thick lens formulae in the general case of different media at both sides of it. These equations are finally used to obtain the optical parameters of a human eye for two models presented in the literature. This work could be of interest in courses of Geometrical and Ophthalmic Optics. JIMÉNEZ-MARTÍ, D.; BATISTA-LEYVA, A. J.. 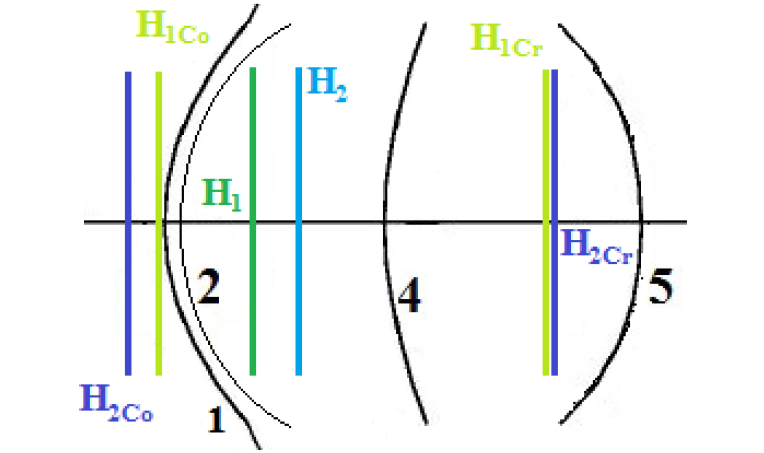 The Optics of a Thick Lens System: Its Application to the Human Eye. Revista Cubana de Física, [S.l. ], v. 35, n. 1, p. 32-38, july 2018. ISSN 2224-7939. Available at: <http://revistacubanadefisica.org/index.php/rcf/article/view/RCF_35_1_32>. Date accessed: 19 apr. 2019.